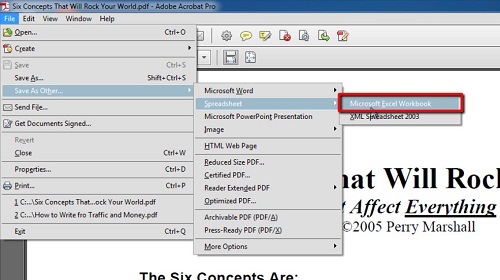 In this tutorial you are going to learn how to convert pdf to excel in Acrobat XI. Start Acrobat and open a pdf document by choosing “Open…” from the Welcome Screen. The Welcome Screen is a window in the document area that appears when no document is open. The “Open…” icon is found on the left portion of the Welcome Screen, just under the Adobe Acrobat XI title bar. There are several alternative methods to open files within Acrobat, or from Windows. Once your document is open, choose “Save As Other -> Spreadsheet -> Microsoft Excel Workbook” from the “File” menu. A standard “Save As” window pops up, where you must select a location and type a filename for the newly converted file. Complete the procedure by pressing the “Save” button near the bottom of the window on the right hand side. To view your converted Excel file, just open it as you normally would. 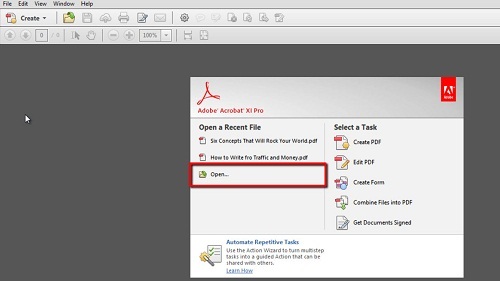 This is how to convert pdf to Excel in Acrobat XI.